It may be the NFL offseason, but one pair of Atlanta Falcons players suited up in full gear and helmet Wednesday afternoon, though it wasn't on gridiron. 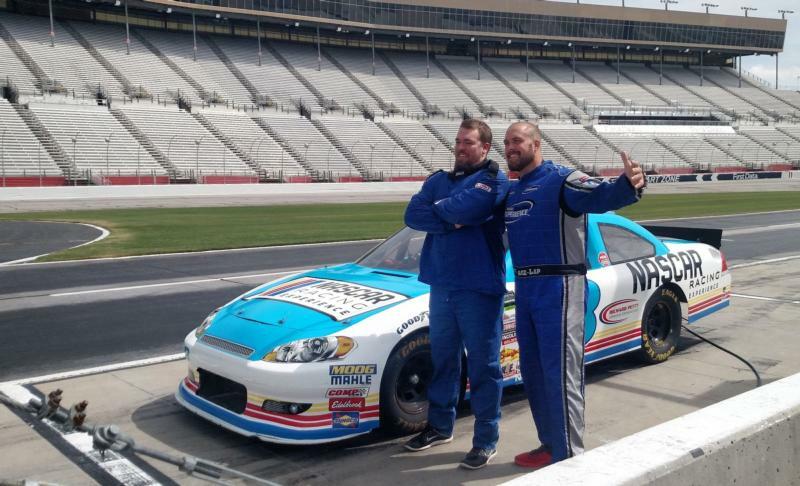 In fact, offensive guards Ben Garland and Wes Schweitzer traded grass and footballs for asphalt and stock cars on a visit to Atlanta Motor Speedway to experience first-hand what it's like to go 180 mph on one of NASCAR's fastest tracks. Both Garland and Schweitzer were part of the official Georgia Host Committee at last month's Folds of Honor QuikTrip 500 NASCAR Weekend at AMS and couldn't wait to experience the high-speed action for themselves. "When we came here a couple of weeks ago, the attention to detail that goes into every car, every car is made for each different race track - I was really impressed by all the different explanations that went into racing," said Schweitzer. "When I first came, I definitely had respect (for the drivers), but I think after today, I'm going to have a new level, for sure." Garland, who heads into his fifth NFL season in 2018 knew from the second the green flag waved in the Folds of Honor QuikTrip 500 that he had to experience it first-hand. "The first time I was at Atlanta Motor Speedway, we got to watch a race, and we were unbelievably excited," Garland said "because I knew nothing about NASCAR before going, and we had a blast." "I had no idea what to expect. You look at this track and it's a mile and a half and it's so big and in less than 30 seconds, you're already around it. It was unbelievable. The turns look so far from each other, but the turns come like that it's like that, and you just feel like you're constantly going in a circle." As far as their regular day jobs go, both linemen are already looking forward to the 2018 season. "I'm excited," said Garland. "I think we've got a great team, and we're coming together. We're doing little bonding events like this, and becoming tighter as a team, and we're training hard. I think we're going to have a great team this year, and I'm ready to get after it." Said Schweitzer, "I'm looking forward to another great year and building on where we made our culture and the brotherhood. I'm excited for the season." NASCAR racing returns to Atlanta Motor Speedway in 2019, featuring all three of NASCAR's national touring series, including a Saturday Xfinity Series and Camping World Truck Series doubleheader.